In the first photograph the quiet man stands, smartly dressed, relaxed, his black-suited back to us, indifferent. 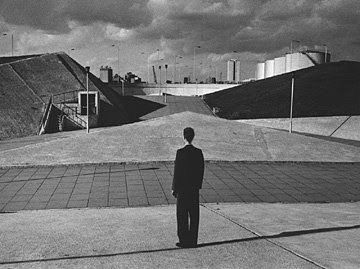 He looks out across a bare industrial landscape of sloping concrete surfaces. The plane of his body appears to bisect this geometric concourse, imposing a symmetry that we can't help but feel exists only from this one vantage point. Skinny light standards dot the horizon. Their long shadows echo, indeed incorporate, the shadow of the man himself. His form is subordinate to theirs. There is a lonesomeness here, but also a definitive peace. The posture of the man is not strained. His hands are by his side and his body is relaxed. 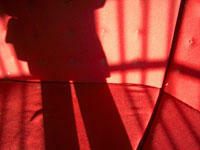 He stands in an aspect in relationship to his surroundings that tells of a choice already made. No tension mars his disposition. To his left is a concrete pyramid with an entry-way of shadowed stairs. To the right is a grassy hillock, an embankment that might be all that remains of the natural world in this constructed place. Let us call him "Y", since that bifurcating letter speaks of the choice, one path becoming two. It is an important detail that by the time this photograph is taken, the man has already made his choice. Cameras are not quick enough to capture the moment; thought is too fleeting. The best these mechanical tools can do is to show us the immediate result of thought unseen. The symmetry of the scene is set askew by the choice the man has made. He is angled out to face to his left, to greet the concrete. He appears to have chosen artifice over nature. But the photographic rendering is so perfect that I can't help but think it represents a correct choice, at least from his perspective. The man we call Y must realise that those planar constructs are the truest forms here. The grass is far from natural; it's a monoculture planted to secure an embankment from erosion. It serves a practical purpose to an economic end. For Y to choose the hillock would be for him to choose fakery and deception. Instead he is relaxed in a decision that favours the concrete concourse, the modern landscape. The man has chosen simulation and can now relax in its carefully constructed embrace. He stands perpendicular to his shadow, oblivious. 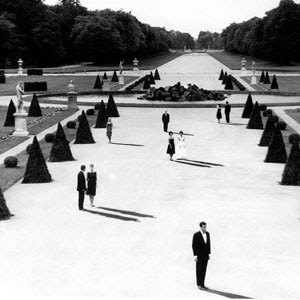 The second photograph is taken in the gardens of Marienbad. Or is it Frederiksbad? Or Karlstadt? Actually, it's none of the above. The director of this shot plays all the cards and knows exactly when to pick them back up off the table. He might tease us with three or four options, possible locations for the unfolding action (if "action" is indeed the right word). But they are all false choices in a literal hall of mirrors. This photograph is not a still from a film that did not take place in any of the places properly named in its dialogue. But let's believe, for a moment, the fiction of the film's title and assume that this photograph was taken Last Year In Marienbad. The characters are displayed as silent ciphers in a formal garden created in the French style, pruned trees and cemented concourses wide enough for military marches. The gardens signal political actions and serve political ends. In the great house adjoining this garden live figures who see themselves as beyond politics, beyond even society itself. The aristocrats in tailored suits and Chanel outfits deploy themselves in singlets and pairs against the clipped geometry of the garden. In the foreground is a solitary male in formal wear. He stands facing us in three-quarters view. The harsh light renders all clearly. We shall call him "X". The inhabitants of this great house of memory play out a series of games designed to reassure themselves that they are still alive. To simulate economics they bet on poker. To simulate social structure they play dominoes. To simulate violence they shoot pistols at false targets. To simulate politics they play a power game involving matches. To simulate simulation they pretend to be in a play. But they are anyway. All of this pretense takes place in a house of endless hallways, staircases and mirrors, in a labyrinth of hidden desires that stands in for our memory. We attempt to retrace a path, but are unable, since this is but a memory of a path, or a memory of a memory, and not the real path itself. Should we face left or right, to the virtual or to the simulation? It's no longer possible to tell. Let's go back to X in the photograph. X, the letter that is it's own mirror, and which branches not only into the future but bifurcates the past. X, the useless letter, the symbol with no purpose except to always question itself. X, the dead letter that marks the spot where a crime has been committed. X, the signature for someone who wants to hide. Or for the amnesiac who hides from himself. At first glance everything in the shot seems perfect, in harmony. But most observers note after closer inspection that the trees are missing their shadows. This is perplexing, but is usually dismissed as a touch of surrealism. It's nothing so trivial. Instead, think of the photo with mirror-thought. It is not the trees that have lost their shadows, it is the people (these fictions of people) who have recreated theirs. It is high noon. The sun is bright and perfect in the sky. There are no shadows to be cast. But in order to assure themselves that they still exist, X and his fellow specters have created lithe perfect shadows, all in a row. It's a game they play, like breathing. Note how X stands directly in line with his shadow, not simply acknowledging it, but focusing all his attention on its being. In theory this game should end. One by one the participants will pick up their shadows and go home. But whoever picks up the last shadow loses. So they defer to each other, endlessly defer out of that most potent decorum, the politeness that masks primal fear. So X never leaves; the phantoms never go home. The first photograph is an amazing piece by Brian Griffin, whom you can read more about.